Taekwondo tradition is based upon positive human values such as self discipline, good conduct, decent behavior, sincerity, honesty, and integrity. Below are steps on what it means to be a Tae Kwon Do student and what you would do every class. 1. State the student creed. Though all may share a prevailing theme, it may differ among schools. 2. Show courtesy and respect to the instructor and all other students at all times. Black belts should be referred to as ‘Sir’ or ‘Ma’am’. At the end of any exercise where you have worked with a partner or group, you must bow to your partner or to the members of your group and say ‘Thank you’. 3. Persevere: exercises are often tough and there will be many times when you want to give up, but to persevere is to carry on regardless. 4. Adopt an indomitable spirit: it is likely that you will suffer setbacks at some point during your practice of Taekwondo, but it is important not to let these put you off. ‘Fall Seven times, stand up eight’. 5. Be sensible: don’t over train or try to continue with an injury. 6. Grade whenever possible: don’t miss a grading, prepare yourself properly and be ready for it on time. 9. Compete in tournaments: put your skills to the test against new people. Watch other students and pick up tips. 10. Do extra exercise outside your Taekwondo classes to build fitness, strength and flexibility. 11. Eat sensibly: make sure your diet is high in protein for muscles and carbohydrates for energy (especially on training days). 13. Drink water: before, during and after training. Dehydration can seriously affect your performance. 14. Practice everything you are taught. Go over all the patterns every week to keep them fresh in your mind. 15. Stretch so that you don’t damage your muscles. For more information on our Miami Tae Kwon Do classes, contact Better Families by calling 305-663-1882. Many experts agree, Tae Kwon Do is a healthy sport for all those who participate, especially children, who gain a number of physical and mental benefits through the practice. Some children start as young as three years old and see improvements in physical strength and balance, concentration, discipline, self-confidence, and even reduced aggression. 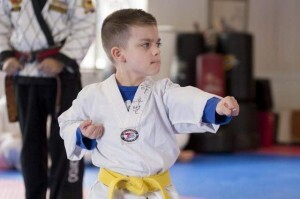 Recently, the mother of a developmentally challenged 7 year-old boy shared his very inspiring story online- a story that highlights just how strongly Tae Kwon Do can impact a life. The young boy’s name is Noah Hoover, who was diagnosed with Attention Deficit Hyperactivity Disorder and suffers from a medical condition called hypotonia, decreased muscle tone resulting from malfunctioning nerve impulses in the brain. To combat the decline of muscles and to help develop movement, Noah attends weekly sessions of physical therapy, occupational therapy and speech therapy. His mother also placed him in Tae Kwon Do classes, hoping that it would instill focus and drive in him. “I really think that Tae Kwon Do has really pushed him to get where he really needs to be,” Shelly Hoover said. “When he first went to Tae Kwon Do, it was hard to even watch him because he was struggling so hard to even balance on one foot. Going from that to being able to do all of these moves is great.” Now, it is hard to notice any difference in level between him and his friends. If you’re interested in our Miami Tae Kwon Do classes, contact us today! It is never too late to get started on the rewarding journey that is learning and mastering a martial art. Our emphasis is on establishing discipline, respect and courtesy in each student. This concept is built into every aspect of Tae Kwon Do instruction through the positive reinforcement of Martial Arts protocol. For more information on our school, contact Better Families by calling 305-663-1882. 1. Taekwondo is one of the two martial arts to be included in the Olympics (the other one is Judo). The International Military Sports Council introduced Taekwondo as a sports event in the Olympics on April 9, 1976. 2. Nowadays, commands or even numeral counting is spoken in the Korean language for Taekwondo. 3. The values that students of Taekwondo learned are not just applied in the sport. The Tenets of Taekwondo are characteristics that students must incorporate in their daily lives as well. 4.Today, over 70 million people in 188 countries practice Taekwondo. 4 million of them are black belts. 5. In the competing event of Taekwondo in the Olympics, only sparring technique is allowed. But in typical competitions, techniques such as breaking, self-defense, patters and also sparring is allowed. 6. 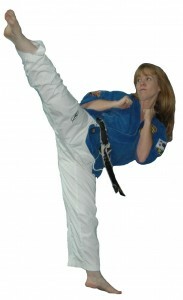 The most common injuries in Taekwondo are bruisings and leg pulls and strains. 7. Usually associated with the Japanese martial art Karate, Taekwondo actually originated in Korea around 2,000 years ago. 8. The Taekwondo uniform is called the “Dobok”. A white belt is included upon the first rank, and the belt color would change as one advances in their ranks. 9. Taekwondo literally means “the way of the foot and fist” because Tae means “to destroy with the feet”, Kwon is “to strike” and Do is “path” or “way”. 10.Taekwondo is both a martial art and a combat sport. 11. Taekwondo training generally includes a system of blocks, kicks, punches, and open-handed strikes and may also include various take-downs or sweeps, throws, and joint locks. 12. Taekwondo is also seen in Chuck Norris , Jean-Claude Van Damme and Tony Jaa movies, as well as many Hong Kong action films. 13. Taekwondo is more than just kicks and punches – it relies on concentration, combat philosophy, self-defense, and physical fitness. 14. The largest Taekwondo tournament organization is the World Taekwondo Federation (WTF), headquartered in South Korea. 15. The Taekwondo Belt System There are six colors of belts: white, yellow, green, blue, red, and black. For information on our Miami Tae Kwon Do school, contact Better Families by calling 305-663-1882. When looking for a martial arts course for their children, parents often wonder about the differences between Tae Kwon Do and Karate. Here are some quick bullet points that illustrate the basic differences between the two. • Martial art style that emphasizes spectacular kicks. Punches and hand/arm strikes can sometimes receive less focus. • Often taught by Korean immigrants (in America). Your child is likely to learn some Korean (i.e. how to count in Korean). • Taekwondo is an Olympic sport. Therefore students will often be encouraged to spar according to Olympic rules (in a controlled environment and with protective gear). • There are different styles/schools within Taekwondo (such as WTF and ITF). • Not a “soft” martial arts style such as Tai Chi. • Not a “grappling” martial arts style such as Judo. • Will teach your child basic self-defense. • Martial art style that emphasizes punches, strikes and kicks. There tends to be more emphasis on punches and strikes than Taekwondo. • Often taught by Americans (in America). • Karate is not an Olympic sport. Judo is currently the only Japanese martial art in the Olympics. • There are different styles/schools within Karate (such as WKF and WUKF). Both forms of martial arts are beneficial physically and mentally and can improve coordination, balance, discipline, among other things. If you’re trying to decide what’s best for your child, it is important to look past technique and into the establishment providing the education that will change your child’s life. Better Families’ emphasis is on establishing discipline, respect and courtesy in each student. This concept is built into every aspect of Tae Kwon Do instruction through the positive reinforcement of Martial Arts protocol. The program builds confidence and character by providing students with control over their bodies and developing their ability to stand up to peer pressure and other intimidating situations. No matter the age level, our programs are exciting, motivating, and fun! For more information on our Miami Tae Kwon Do classes, call us at 305-663-1882. Better Families is a Miami Tae Kwon Do school located on 5754 Bird Road in South Miami that has been in operation since 1989. Our mission statement is to promote fitness and self-discipline among families through the teaching of martial arts, namely the system of Tae Kwon Do developed by well-known martial artist Jhnoon Rhee. It applies a philosophical approach to martial that emphasizes not only physical strength but integrity, confidence, ethics, and academic performance. We have programs available for all level of martial artist, from beginner to expert, and offer Children, Teen, and Adult programs to include entire families in our dojo. They are designed to teach our students a high level of Martial Arts with many other benefits. Better Families will help each and every student maximize their potential by bringing out the best in themselves. Our curriculum was designed to fit all levels whether beginning or advanced. Our emphasis is on establishing discipline, respect and courtesy in each student. This concept is built into every aspect of Tae Kwon Do instruction through the positive reinforcement of Martial Arts protocol. The program builds confidence and character by providing students with control over their bodies and developing their ability to stand up to peer pressure and other intimidating situations. No matter the age level, our programs are exciting, motivating, and fun! Black Belts Schools of America has described our group as being “among America’s top most prestigious martial arts schools” and several of our instructors have received accolades, including our founder and director, Master Mary Beth Klock-Perez. Over 600 families have been served by the studio, which formally encourages the participation of beginners. In addition to selling sparing equipment, Better Families regularly provides birthday party services for children. Experts Agree- Tae Kwon Do is Beneficial to Your Kids! Tae Kwon Do, a martial art that originated in Korea, is one of the world’s most popular martial arts. Mimi Johnson of the of the American Academy of Pediatrics’ Committee on Sports Medicine and Fitness recommends 6 years of age as a good starting age for kids taking martial arts, although some classes will take children as young as 3 years old. Below are the great benefits of Miami Tae Kwon Do for children. One of the main benefits of Tae Kwon Do is improving a child’s strength and balance. Because Tae Kwon Do depends on kicking, practitioners learn to balance their weight on one leg to leave the other one free to strike. This also helps strengthen the muscles of the torso. Tae Kwon Do can also help improve coordination. Arm and leg muscles become stronger as a child practices strikes. Learning the patterns and sequences of Tae Kwon Do requires concentration and attention, and sparring requires focus on both one’s self and one’s opponent. Tae Kwon Do teaches breathing and meditation techniques to assist in learning focus. Tae Kwon Do students must learn to follow directions from an instructor and are expected to show respect to the instructor. Students are also expected to show respect to their opponents before and after a sparring match. As children dedicate themselves to a goal in Tae Kwon Do- say, learning a particular strike, earning a belt or practicing how to break a board- they gain confidence as they observe their own progress and increasing mastery. This self-confidence can then be carried over into other areas of your child’s life. Tae Kwon Do will not teach your child self-defense skills to directly deter bullies, but taking Tae Kwon Do might prevent your child from becoming a bully. A study published in “Psychology in the Schools” in 2008 showed that martial arts participation reduced aggression in boys. The study also showed an increase in bystanders choosing to intervene in a bullying event after taking a martial arts course. For more information on our classes, contact Better Families by calling 305-663-1882. Better Families Flash Mob at Dadeland! Besides an outstanding Miami Tae Kwon Do education and mastery, there is one thing you are guaranteed to have when you become part of Better Families: fun. Over the weekend, a number of our students and instructors made their way to Dadeland Mall and participated in a hypnotic “at form” flash mob performance in the continuous effort to open up to our community and add member to our family. Great job to all those involved; we nailed it! If you’re interested in our Tae Kwon Do classes, contact us today! It is never too late to get started on the rewarding journey that is learning and mastering a martial art. We have a variety of programs suitable for all ages, as well as South Florida’s most dedicated instructors that will cater to your individual needs and abilities. Our emphasis is on establishing discipline, respect and courtesy in each student. This concept is built into every aspect of Tae Kwon Do instruction through the positive reinforcement of Martial Arts protocol. The program builds confidence and character by providing students with control over their bodies and developing their ability to stand up to peer pressure and other intimidating situations. No matter the age level, our programs are exciting, motivating, and fun! For more information on our Miami Tae Kwon Do services, contact Better Families by calling 305-663-1882. At Better Families, we teach the Jhoon Rhee system of Tae Kwon Do, introduced to America in the 1950’s. Jhoon Rhee is a legendary South Korean martial artist who has spread his groundbreaking martial arts philosophy both here and abroad ever since arriving to America, becoming one of the world’s most famous and influential martial artists. Today Tae Kwon Do has evolved into not only the most effective method of weaponless self-defense, but an intricate art, an exciting sport, and effective method of maintaining physical fitness. Tremendous skill and control are required in Tae Kwon Do. While blocking, kicking and punching techniques all contribute to making Tae Kwon Do one of the most exciting and competitive sports, its challenge lies in the adept use of techniques without having actual body contact. Complete control over punching and kicking movements is paramount in stopping just centimeters short of the opponent. Through the coordination of control, balance and technique in the performance of hyungs (forms), Tae Kwon Do is regarded as a beautiful and highly skilled martial art. It is also one of the most all-around methods of physical fitness, since it utilizes every single muscle of the body and is considered the ultimate in unarmed self-defense. Count on Better Families to bring you and your family the leading education venue in Miami Tae Kwon Do. We are recognized by Black Belts Schools of America as “among America’s top most prestigious martial arts schools”. In addition to enjoying this recognition by our peers, Better Families is most proud of our solid reputation within the community. Over the years we have blended the philosophy of the Korean Martial Arts to create a perfect harmony between Knowledge in the Mind, Honesty in the Heart, and Strength in the Body. Contact Better Families today by calling 305-663-1882, and watch your child develop confidence, self-discipline, academic excellence, and the willpower to achieve any goal. Better Families is a Miami Tae Kwon Do school located on 5754 Bird Road in South Miami that has been in operation since 1989, specializing in the system of Tae Kwon Do developed by well-known martial artist Jhnoon Rhee. We are committed to nurturing better families through the discipline, focus, and hard work inherent in Tae Kwon Do training. It’s the most wonderful time of the year, as they say, especially for spending time with family. As such, our December schedule features less school days for the holidays. Better Families will be closed December 24 through December 26th, as well as December 31st and January 1st. On December 23rd, we will have half-day classes at 10 am, 11 am, 6 pm, and 7 pm. Relax, celebrate, and cherish the season with family and friends. Despite the days off, December also marks a very busy month for us. The first week we are having Green Stripe Testing, a number of private birthday parties throughout, and Graduation on December 20th (starting at 7 pm). If you are new to martial arts and are interested in coming in to see what we’re about, check out our great Introductory Class to learn more about our Better Families programs. It is a 30-minute, semi-private lesson with a Black Belt Instructor, where you will be practicing basic kicks and punches while you learn about the philosophy, respect and discipline of the Martial Arts. It is a great opportunity to come in and visit the school, meet the instructors, and find out about the benefits of learning Tae Kwon Do. You will also be learning the fundamental steps in order to follow classes with total confidence, including learning how to move with speed and power and basic self-defense. It’s never too late to start getting fit. In fact, there may be no better time than during the holidays to commit and start your path to a healthier life. Many people find it hard to keep weight off during this time of the season due to the stress, food, business, and any number of reasons. At Better Families through Tae Kwon Do Miami, Florida, our instructors will work with you to help you reach your goals. Our Martial Arts expertise combined with our experience and knowledge in physical fitness have helped students become champions as well as lose weight and get into shape. We offer a great Introductory Class to learn more about our Better Families programs. It is a 30-minute, semi-private lesson with a Black Belt Instructor, where you will be practicing basic kicks and punches while you learn about the philosophy, respect and discipline of the Martial Arts. It is a great opportunity to come in and visit the school, meet the instructors, and find out about the benefits of learning Tae Kwon Do. You will also be learning the fundamental steps in order to follow classes with total confidence, including learning how to move with speed and power and basic self-defense. This is what I have talked about seeing at the Kukkiwon!!! The most amazing part ?? The self disciple factor ! No-one appears to need to tell.. It happened !! Twelve years in the making .. My promotion to sixth dan. It was a huge honor that so many great Masters and Grand Masters traveled..